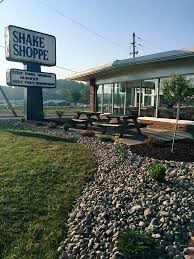 ﻿ Shake Shoppe - Ohio. Find It Here. Shake Shoppe is a family owned and run restaurant in Gallipolis, Ohio.The store opened in 1951 by Frank + Marge Snedaker with a menu of hot dogs and ice cream.Jeff + Vera Snedaker bought the stores from Jeffs parents in 1985 and continued to serve up that old fashioned goodness.And now, since 2008, their youngest son, Tim, and his wife Andrea, own the stores.Visit us at 901 Second Ave or 383 Jackson Pike in Gallipolis, Ohio.